The UPMC Hillman Cancer Center Developmental Funding Program is intended to support the development of cancer research led by Hillman members and to stimulate new applications for extramural funding. All UPMC Hillman Cancer Center members are encouraged to apply. Each award will be up to $50,000 for one year, with an expected start date of July 1. Funds should be expended within one year of receipt. Contact Moira Hitchens for requests to change the start date or extend the funding period (no-cost extension). A report summarizing financial expenditures and a one-page summary of the scientific outcomes of the project will be required two months after the end of funding or earlier if warranted. When requested, all awardees will be expected to provide updates of publications and long-term grant support that originated from the award. Principal Investigators must have a University of Pittsburgh faculty appointment and be a Hillman Cancer Center member. Membership requires an application process that can be found on UPMC Hillman Cancer Center website. If you are unsure about your eligibility, please contact Moira Hitchens (hitchensm2@upmc.edu). Applicants can be PI on only one Pilot Award proposal per round but can be named on other proposals as a Co-Investigator. A single Pilot Award can have multiple PIs. Faculty awardees may be asked to participate in the review process for four future rounds (two years). Proposal review committees will be chaired by a Hillman associate director and be composed of Hillman members. The review committees will be made up of both former awardees and ad hoc experts, chosen based on the applications received. Applications will be assigned to two reviewers having the appropriate expertise. Reviewers will score applications according to the criteria listed above, using the NIH scale of 1‐9 (best - worst). Final funding decisions will be made by Hillman senior leadership based on the scientific review and programmatic needs. A brief summary statement will be provided to the applicant. Projects must be completed within the designated period of the grant proposal, which is one year for Pilot Awards. Clinical applicants or others with time-consuming protocol requirements may apply for a change in start/end dates. No-cost extensions must be formally requested. Personnel: Requests for faculty salary support are not allowed. The intent of this award is to fund the generation of preliminary data for a grant submission, and as such, the budget for personnel should be kept to a minimum. Travel: Requests for travel support are not permitted. Equipment: Requests for equipment should be limited to funds directly related to project performance. For example, a laptop for a research assistant to use in clinic to collect data would be appropriate. Unused funds will revert to the supporting funding source. All proposed expenses must conform to the general policies of UPMC Hillman Cancer Center. Awardees of projects that use a Hillman shared resource, e.g., the Biostatistics Facility, Tissue and Research Pathology Services (TARPS), etc., are encouraged to consult with the shared resource director prior to submission and include a letter of support from him/her. Prior to funding, all awarded projects that involve animals or human subjects must be reviewed and approved in accordance with Hillman’s general assurances and HIPAA. Reviews and approvals may be “Just in Time” and are not required for registration/application. Projects involving human subjects must be submitted to an Institutional Review Board (IRB). All investigators and all persons named on the budget page must have certification of training in the protection of human subjects. Appropriate animal forms must also be filed and approved. A summary progress report must be submitted within two months after the end date of support or earlier, if warranted. The summary progress report should give a financial accounting of funds used for the project, and reference all research products planned or generated, including abstracts submitted/published, peer-reviewed articles submitted/published, grant applications submitted/funded, and potential/actual intellectual property (reports of invention, etc.). PIs will provide updates on publications, grants, and patents after the end of funding when asked. Where applicable, progress reports should identify the Hillman catchment area counties and any minority or medically underserved populations that are involved or affected. All manuscripts, abstracts, posters, and presentations should acknowledge support from UPMC Hillman Cancer Center Developmental Funds, e.g., “This project was supported in part by award number P30CA047904 from the National Cancer Institute.” If a Hillman CCSG-supported shared resource provided data, please also include the following statement: “This project used the Hillman Cancer Center [insert name(s) of shared resource(s)] that [is/are] supported in part by award P30CA047904.” Funded investigators that fail to adhere to this policy will be barred from future submissions to the the Developmental Funding Program for a period of one year. Awards co-funded by multiple sources will also adhere to reporting and other requirements established by those sources. Faculty awardees may be asked to serve on review committees. A Title Page that includes the following items. Please note that submitting online does not automatically create this title page. if the proposal is in response to the targeted RFA. Note: If applying for the targeted RFA, see the RFA below for additional information that should be included on the title page. Scientific Abstract: The abstract summary of the proposal. For use by review committee members and UPMC Hillman Cancer Center (250-word maximum). Lay Abstract: A brief summary of the proposal, written for the general public (100-word maximum). Budget: Use PHS 398 Form Page 4 https://grants.nih.gov/grants/funding/phs398/398_fp4.docx. Introduction: If your proposal was not funded, you may submit the same idea again, one time. For re-submission, include a ½ page response to the previous critique. Note: If applying for the targeted RFAs, see the RFAs for additional information that should be included in the Research Plan. If human subjects will be involved in the research, provide a description of their involvement and characteristics, specific risks to subjects who participate, and protection against those risks. Describe the sources of materials that will be obtained from human subjects as part of their study participation. Provide assurance that the project will be reviewed and approved by the Hillman IRB and comply with HIPAA. If vertebrate animals are to be used, describe the proposed use of the animals in the work outlined and procedures for ensuring that discomfort, distress, pain and injury will be limited. Projects involving animal subjects must be reviewed and approved by IACUC. Applications are due by 5 pm ET on May 1, 2019. All applicants must register and submit their proposals through the online form on this site. The online form must be completed in one session ‐ it does not save partially entered information and you cannot return to it at a later date to finish your submission. Registration and submission must be completed by 5:00 pm on the deadline date. Investigators must submit (upload) their entire application as a single PDF. Applications missing one or more of the required components (registration and uploaded single PDF with the PI's name in the file name) will be considered incomplete and will not be reviewed. Extensions of the deadline will not be granted. Supplementary or additional materials will not be accepted after the submission deadline. The UPMC Hillman Cancer Center Developmental Funding Program seeks to encourage new research that addresses the role of genomic profiling in precision cancer medicine. Hillman has a robust program of basic, translational, and clinical cancer genomics. These studies are discovering novel aspects of cancer genetics, new diagnostic and prognostic tests, and understanding the implementation of sequencing in therapy decision making. Hillman seeks to promote research in all of these areas, e.g., development of new diagnostic/prognostic tests which can identify high risk disease, and analysis of the clinical benefit and/or utility of current clinical testing (solid and liquid biopsies). State on the title page that the project addresses cancer health disparities. Questions? Please contact Moira Hitchens, PhD (hitchensm2@upmc.edu) or Adrian V. Lee, PhD (leeav@upmc.edu ) with any questions regarding development funding for cancer genomics. Cancer can result from environmental factors that interact synergistically with both genetic and additional susceptibilities. 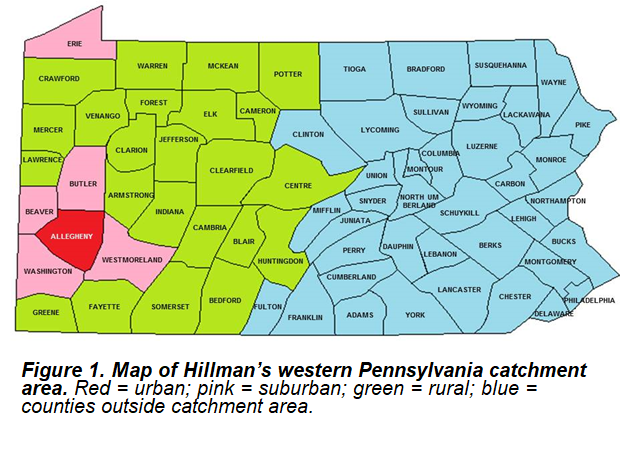 The Hillman Developmental Funding Program seeks to encourage new research that addresses the role of environmental factors in the development of cancer within the Hillman catchment area. Environment is defined broadly to include not only air pollutants but also exposures associated with radiation, diet, occupation, residence and personal habits or lifestyle. The overarching goal of this funding opportunity is to initiate research addressing the specific and unique environmental factors that may contribute to the development of cancers of high incidence (i.e., breast, prostate, lung, colon and bladder cancers) or mortality (i.e., lung, breast, prostate, colon and pancreatic cancers) within our catchment area. This includes studies of factors that modulate cancer incidence, risk, cancer patient survival and quality of life. State on the title page that the project addresses the role of environmental factors in cancer. Include in the research plan the specific Hillman catchment area counties and any environmental factors/risks involved in the study. Questions? Please contact Moira Hitchens, PhD (hitchensm2@upmc.edu ), Linda Robertson, RN, MSN, DrPH (robertsonlk@upmc.edu) or Margaret Rosenzweig, PhD (mros@pitt.edu) with any questions regarding development funding for cancer and the environment.